Click-to-Call is a service you can add to any web page that lets your web visitors enter their phone number, tab a call button and the Click-to-Call service will instantly call back the web visitor on the entered phone number and connect the call to your mobile or company phone number. It is a powerful solution that can easily be installed on website to integrate Click to Call service that allows your visitors to easily get in touch with you and ask their questions or gain information about the service or product they are looking for. Our Click To Call Service, is a unique way to exceed your customers’ expectations and create a positive customer experience. It gives quick and accurate respond to customers’ queries. Click to call services make your website as a Toll Free Website. 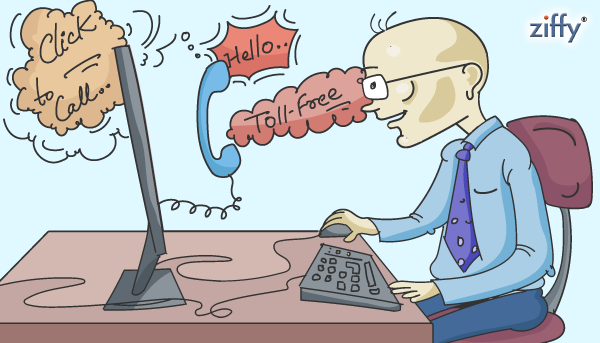 If you sell anything on line, a toll-free number is an asset to your business. Even in the age of cell phones, an 800 number gives your business credibility if you are selling items across the country or world. Setting up this service is surprisingly easy and inexpensive.If you relocate, your 800 number can easily follow you to your new location for free. Just be sure to notify the phone company of the move. A mobile-friendly alternative to a toll-free number is the click-to-call button, which can easily be added to your website. To be connected with you by phone, a customer simply clicks a link or button on your website that brings up the dialer on their smart phone. Generate better selling opportunities for consumers in the “purchase” phase of decision making. Improve customer perception of your business. Quickly provide answers or help customers accomplish their goals. Generate calls for better customer service with a real person. Provide more information than can be made available on line. Make it easy to accomplish the major reasons for calling a business such as booking appointments/reservations or checking business hours. As Click-to-Call becomes more of a fundamental aspect of the consumer-focused Websites of today, those that lack the ability may find that visitors to their sites are leaving to look for the competitor that offers this direct line to a live agent. Considering the benefits for all involved, Click-to-Call technology is too valuable to be ignored.